The “Four-Four” mnemonic (as in April 4th) has a special meaning for me for the past eight years. I have no idea who took the picture – some random stranger who happened to be in the right place at the right time. There was no one else around and I really, really needed the picture to be taken. I remember seeing someone walking by and I shoved my point-&-shoot camera at him and asked if he would take the picture. He did and walked away. 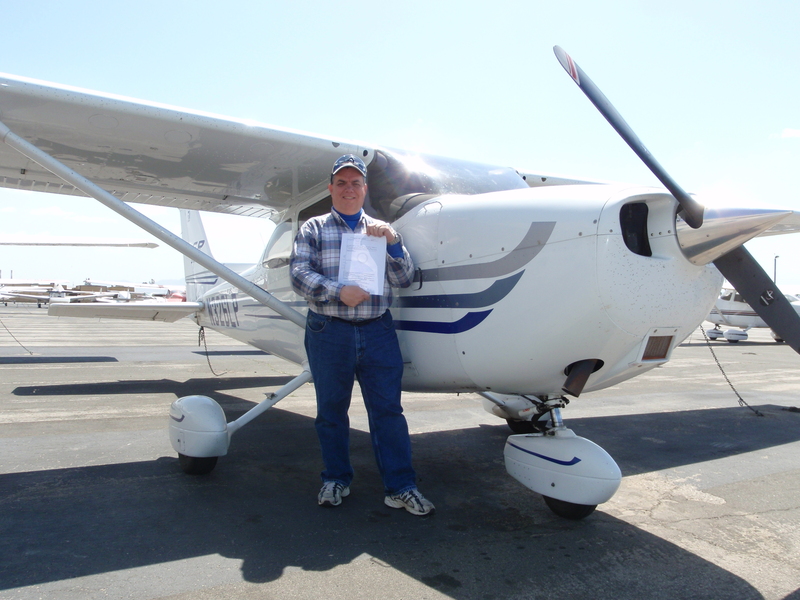 I was a bit discombobulated and excited – I had just passed my FAA Private Pilot practical exam (otherwise known as a “checkride”) and was now a full-fledged private pilot, single-engine, land. That’s my certificate that I’m holding. We landed, I taxied in and shut down the engine. He got out and started to do paperwork while I pushed the plane back into its parking space and tied it down. He came back over to me and I asked what was next, expecting to be told I needed to work on A, B, C, etc and then I could take the test again. Instead, he said he was going to start filling out my private pilot paperwork inside, when I was done locking up the plane I needed to come in and sign it. April 4, 2009. It was a very good day.